Holds wakeboards, surfboards, snowboards, and more! The Premium Birch Wakeboard Rack is a storage solution that looks as cool as your boards do. But don’t let the good looks of this rack fool you. The Wakeboard Wall Rack is as strong as it is attractive. It has been tested to support up to 160lbs. The Birch Wakeboard Wall Rack also comes with two accessories hooks at the bottom for hold wetsuits, towels, or whatever gear you need. 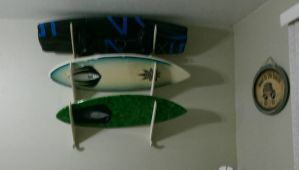 The Wakeboard Wall Rack works just as well for boards with bindings as it does with just boards. In fact, you can feel free to mix and match any type of board you like. Additionally, this rack is also great for other boards you may have too. It’s awesome for surfboards, snowboards, and even longboard skateboards. Feel free to combine all the boards you have on this versatile rack. This wakeboard wall rack has a really cool feature - its unique wall mounting system. Each rack arm is actually “hooked” into a cross support bar and allows it to independently move around. What this means for you is that mounting the rack is super easy and forgiving. For instance, say you mounted a wakeboard rack permanently on the wall, then went to put your boards in place but then found that you mounted the arms too close together. With a normal rack, you would have to undo all the work you did and live with the old holes in your wall. With the Birch Wakeboard Wall Rack’s mounting system, you can simply slide the arms apart to your desired distance and voila! I purchased the Birch Wakeboard Wall Rack that holds three boards. It is a beautiful addition to my house. It gives my boards a showroom quality. The hook on the bottom to hang a wet suit is a great addition. I am very pleased with my purchase.